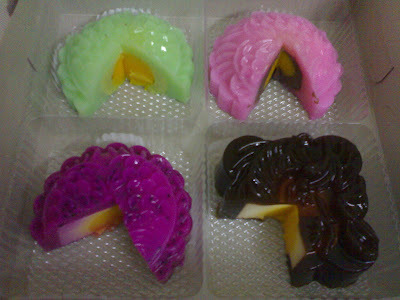 Look at these jelly mooncakes! Aren't they pretty? All of them have 3 jelly layers - the outer colorful layer (pale green - pandan, pinkish - red bean, purplish - dragon fruit, dark brown - coffee); the second layer (milky); and the innermost egg yolk-like layer. Yummy!